The U.S. Army's top brass joined Secretary of the Army Mark T. Esper at the christening of the Army Futures Command in downtown Austin. 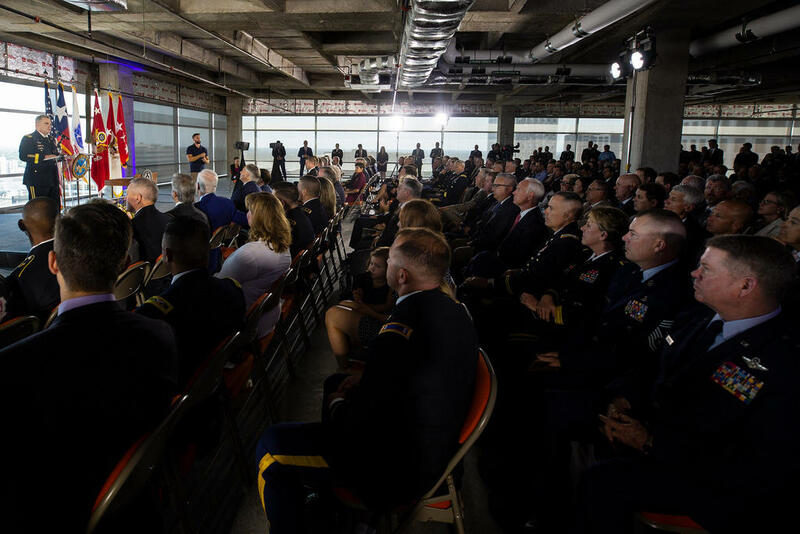 The most significant reorganization of the United States Army in 45 years formally launched Friday in Austin with the activation ceremony for Army Futures Command. The center aims to bolster battle-ready technology for future conflicts by leveraging local, state and federal tech talent. Last month, when the Army announced the selection, officials cited Austin's higher learning and technology sectors as the reasoning for the choice. U.S. Army Chief of Staff Gen. Mark Milley echoed that emphasis today at the downtown ceremony. “We know there’s a multitude of emerging technologies that are going to have, whether we like it or not, impact in the conduct of military operations," Milley said. "It is this command – in this building, right in the heart of Austin – that are going to determine victory or defeat in a future battlefield for the United States of America. That’s how important this command is for the future of our country." Army civilian staff and servicemembers will collaborate with academics and tech industry experts to develop those new technologies with a $10-billion annual budget and oversight from Gen. John Murray. "From this location, we will provide the unity of command and unity of effort that will bring the concepts, requirements, science and technology, research, development, testing and engineering and acquisition communities together," Murray said, "to ensure the United States Army remains the preeminent ground combat force in the world forever." Murray's promotion from a three-star lieutenant general to a four-star general was confirmed this week by the U.S. Senate. Futures Command will work in partnership with the University of Texas, the City of Austin and the State of Texas. All told, about 100 soldiers and 400 Army civilian staff will work at the 19th-floor location, housed in the U.T. System building downtown.